Babies who are smaller than they should be at birth after full-term pregnancies can face serious health problems, including a five to 10 times higher risk of dying in the first month. If that baby does survive the first month, he or she will face an elevated risk later in life of developing such chronic ailments as heart disease, hypertension or type 2 diabetes. Now a University of Pittsburgh study suggests that mothers with sufficient levels of vitamin D in their blood, especially during the first trimester of pregnancy, have heavier babies with slightly larger head circumferences than pregnant women who are deficient in vitamin D.
After adjusting for the influence of other factors, the team found that mothers with adequate blood concentrations of vitamin D had newborns weighing 46 grams heavier -- about 1.6 ounces -- than those born to mothers deficient in D, with head circumferences on average 0.13 centimeters larger, or about 1/20th of an inch. Despite the small increase in weight and size, the study found it to reflect a significant difference. Birth weight and head circumference of babies born to mothers deficient in vitamin D rose as the vitamin level rose, then leveled off once the levels reached the study's limit separating deficiency from adequacy. Based on blood work collected in the first trimester of pregnancy, mothers at the adequate level or higher were half as likely to give birth to a baby smaller than its gestational age than women deficient in D.
The study is published online and in the January edition of the Journal of Clinical Endocrinology & Metabolism. While other studies on vitamin D and pregnancy have produced mixed results concerning baby weight, the Pitt study says the evidence "supports a positive association between vitamin D and birth weight." 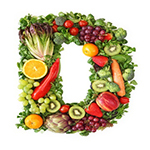 The Pitt study generally supports growing research showing that many women, especially pregnant women, are woefully deficient in vitamin D, which is important in the absorption of calcium and the reduction of inflammation that is a factor in cardiovascular and autoimmune diseases, with further advantages to the immune system. In pregnancy, vitamin D also promotes insulin production and raises blood glucose used to energize cells. Both might be factors in baby weight and head circumference. Carol Wagner, the Medical University of South Carolina professor of pediatrics recognized as an expert in vitamin D, said the average woman gets 200 International Units of vitamin D from food, which is an insufficient level if the women does not get additional D from the sun or supplements. "I think we've studied vitamin D in great detail with a lot of safety, and we've been monitoring the data and can say confidently that 4,000 IUs for pregnant women is safe -- and is safe for any adult," Dr. Wagner said. What still is not understood is how vitamin D is metabolized. Once that's determined, researchers can proceed to understand its impact on human health. For every increase in vitamin D levels in women with deficiency, Dr. Wagner said, the research reveals a reduction in the risk of pre-term labor, pre-term birth and infections. The Pitt research team established a blood-concentration level of D at 37.5 nanomoles per liter. Below that level, the researchers considered the woman to be deficient. Equal or higher blood levels are deemed to be adequate. Despite the limit used in the study, debate continues concerning the optimal level of vitamin D for pregnant women and the population at large. The U.S. Food and Drug Administration's recommended daily allowance for vitamin D is 400 IUs for the young, rising throughout life to 800 IUs for people 70 and older, but Dr. Wagner and the Vitamin D Council advocate that the level be raised dramatically higher. The Pitt study analyzed blood levels of 2,145 women who went full term with their pregnancies along with the size of their babies. The data were gathered in the 1960s, when fewer women were obese but more smoked, which the study says could alter how vitamin D contributes to fetal growth. So study results may not be generalized to apply to women today. The study recommends a randomized trial, with one group receiving vitamin D and a control group receiving a placebo, to test the findings. The skin, not the diet, is the natural source of vitamin D for humans, although supplements and foods fortified with D now are available. Caucasian mothers in the study had deficient blood levels of D only 5 percent of the time, while 50 percent of the African- American women in the study were deficient. High levels of melanin in African-Americans' skin reduces their synthesis of vitamin D during sun exposure due to their heritage of living in sunny climates. That makes African-Americans more susceptible to deficient D levels when they live in northern climates with less sunlight. The study represents the latest in a growing list of health advantages attributed to vitamin D, which actually is a fat-soluble hormone rather than a vitamin. Lisa Bodnar, the study leader and Pitt assistant professor of epidemiology, obstetrics and gynecology, said pregnant mothers should make sure to take a daily prenatal vitamin that contains vitamin D. But she said she will not recommend a vitamin D supplement, other than what is contained in a prenatal vitamin, until the research more substantially confirms its safety and effectiveness. "Certainly women should consistently take prenatal vitamins, and they should make sure they contain the recommended levels of D and are taking it every day. If they can't tolerate it because [the prenatal vitamin] makes them sick, they should take a vitamin D supplement in the same dosage," said the Pitt researcher whom Dr. Wagner described as "an impeccable scientist who's been a leader in vitamin D research." "Ask your doctor to have your levels tested if you are concerned, especially among women with dark skin and during winter months. If you take a supplement to reach a level that all experts agree is not deficient, it would be safe." David Templeton: dtempleton@post-gazette.com or 412-263-1578.